Manila, Philippines – if there is one thing that is good to hear nowadays, it could be Chito Miranda’s proposal with Neri Naig. The two, despite the controversies they went through in the previous months were unshakable in their love for each other. Chito Miranda is Parokya ni Edgar’s front man and Neri Naig is an actress and model. The two are now engaged. Chito prepared a surprise to Neri through a fake music video. This took place in a certain resort where the two of them were present. They shoot the video without Neri’s notion that it was Chito’s scheme. The proposal was done with Chito’s appearance, crying in the middle of the video shoot. Chito then fell on his knees and asked Neri to marry him. Everything was documented and edited as a presentation that was posted on Chito’s YouTube account on Wednesday. The video spread and shared in the social networking sites that gathered applause and appreciation from netizens. Miranda is already 38 years old and is still active with the band he embraced the most. Chito said during his album launch in December that it was already his plan even before. He added that when you are in a relationship, you always think that this would be it. It means to say that Chito Miranda has already a plan even before. Neri was very happy and speechless during the proposal that she taught was a serious video shoot on a certain music video. 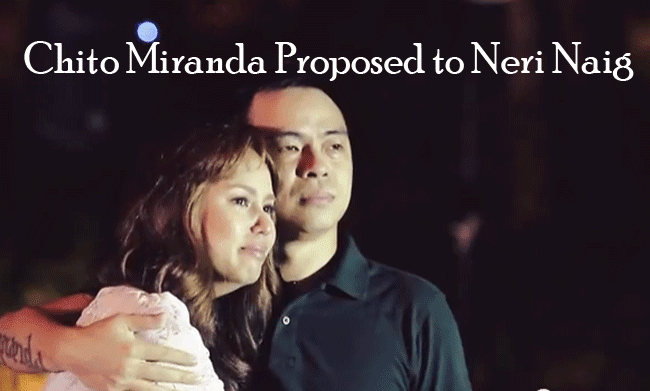 You can watch the video of the said proposal done by Parokya ni Edgar’s front man. Despite all the controversies brought by the alleged scandal video that spread all throughout the net lately, the two has conquered everything. Congratulations to Chito Miranda and Neri Naig. Hope both of you will prosper in life being engaged.